No. 3 Factory conducts forming, and main processing of plate spring and wire spring products. 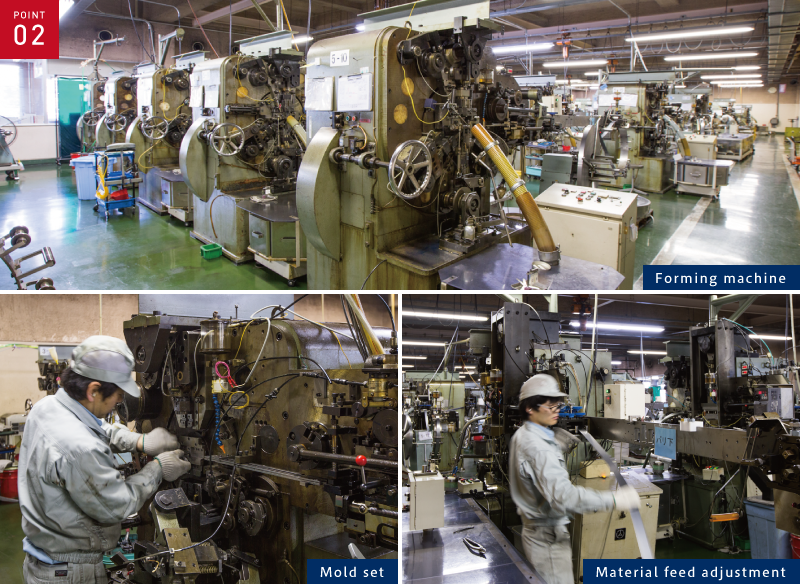 The factory has about 300 forming machines, and operates 24 hours a day inside soundproofed facilities to process Taiyo’s main products. In this factory that handles our main products, it is important to secure materials, and we keep about 1.5 months’ worth of stock. Our in-house forming machines range from Type 1 to Type 6, and operate on 3 floors. We utilize the skills of our mold set men who set several tens of mold types. We inspect and measure the dimensions of the products.